Looking for scottish books? 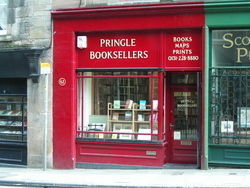 Biblio.co.nz hosts hundreds of of the finest online book stores and booksellers, including specialists in scottish. Use the list below to locate a specific specialist bookseller or book store near you. Or, use the form below to search the inventory of all booksellers who specialize in scottish. We specialise in history, roman and greek classics, books dating from the 17th and 18th century, fine bindings and general second-hand stock.